Located in a picturesque setting on the west coast of Vancouver Island, Tofino is a relaxed and casual community (pop. 1,103). An ideal place for unwinding and "getting back to nature", the area offers beaches with paths to old growth rain forests where caves and secluded coves can be found; craft shops, art galleries, and a museum; fishing boats loaded with fresh crab and salmon; natural hot springs; unsurpassed gray whale-watching; numerous resident and migratory birds, and more. Visitors can choose from beachfront inns and resorts, unique bed and breakfasts, motels and campgrounds. 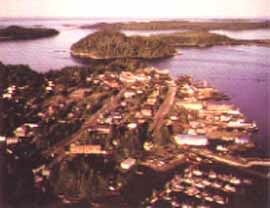 Tofino is north of the Long Beach section of Pacific Rim National Park.